Skagafjörður is a fjord in North Iceland with a population of around 4,200. Skagafjörður has played a significant role in the history of Iceland since settlement. The region boasts a rich saga heritage and many key sites, including those of important historical events that occurred in the early years of Icelandic settlement that had a significant influence on the development of Icelandic society and politics. Home to a strong ecclesial authority, monasteries and episcopal, Skagafjörður was for many centuries the second most powerful centre of authority in Iceland, something that had a significant impact on the culture in Skagafjörður. Skagafjörður is truly a land of adventure for all, and it offers a wide variety of activities set in beautiful surroundings. 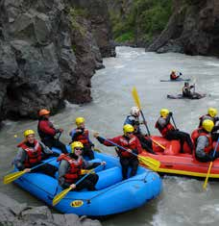 Choose from whitewater rafting down foaming glacial rivers; horse riding in an amazing and unique landscape or sailing to the majestic island of Drangey. Or you might like to delve into the history of this saga rich region; relax in a natural hot spring; enjoy the magic of the northern lights in the winter stillness; indulge in excellent food prepared from local produce; or simply lay back, relax and enjoy your stay. Skagafjörður is not only charming in the summer months. The winter is a time of endless adventure and fun, whether you want to ski, go hiking, snowmobiling in the mountains, or just relax in a hot natural pool. Everyone can find something to their liking in Skagafjörður. is the most engaging of Iceland’s many turf-roofed farmsteads. These farmsteads are reminders of how dramatically Icelandic life has changed within a single lifespan. is a pearl of nature in the middle of the fjord. 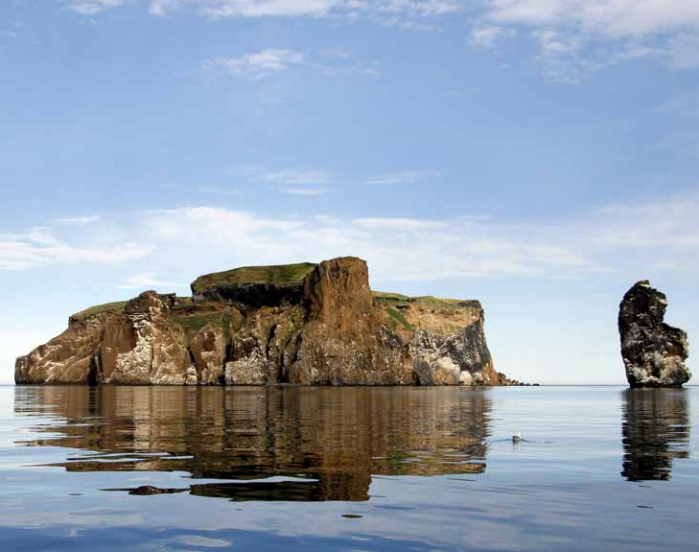 The island is a sheer-sided palagonite rock approximately 180 m high and provides a wonderful view over the whole fjord. The bird life on the island is diverse, although the most predominant varieties are puffins and guillemots. In the famous Grettis Saga, the outlaw Grettir swims from Drangey to the western shore of Skagafjörður, where he bathes in a geothermal spring and then fetches some glowing embers to bring back to the island. 962 years later, in 1992, Grettislaug was rebuilt in open surroundings at Grettir’s legendary bathing spot. The rivers feeding Skagafjörður provide the best river-rafting in Iceland. The Austari Jökulsá is ranked more difficult, while the Vestari Jökulsá is classed as easier. Skagafjörður is the home of the Icelandic horse. There are a number of operators in Skagafjörður offering horse riding tours of various lengths for every level of expertise. You can also visit the breeders and see riding demonstrations. The tradition of driving livestock, such as sheep and horses, to uninhabited areas where they roam free all summer is still a common practice in Skagafjörður. The annual horse and sheep round up is in September, truly a unique national event. Natural hot water flows widely through the fjord, and as a result Skagafjörður boasts a large number of natural hot springs and swimming pools. 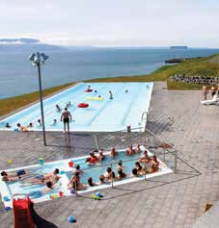 The Hofsós swimming pool is fast becoming one of the most well known pools in Iceland, as well as the most popular tourist attraction in Skagafjörður. It’s located on the cliff top at Hofsós, with super views of the fjord. Whilst swimming, you feel like you could swim directly to Drangey island in the fjord. This is a swimming pool that should not be missed.